From left to right: Emily Machovec, Luis Matty Montes, Emily Alvarado, Nick Rose, Samuel Greenslit, Michael Nugent. Photo by John Cholod. It’s not rare to see a musical that matches the grandiose scale of “Big Fish,” directed by TJ Lukacsina. But shows like that are usually set in Neverland and Oz, not rural Alabama. Based on Tim Burton’s 2003 film of the same name, “Big Fish,” now playing at Silhouette Stages, revolves around the aging Edward Bloom, a former traveling salesman and enigmatic adventurer who is known to tell improbable tales of his travels. When his cancer worsens, his son, a straightlaced skeptic named Will, begins investigating the truth behind his father’s fables, in hopes of learning who his father really was. Overall, Silhouette Stage’s “Big Fish” was a show just as fun and fanciful as it was emotive and full of heart. The show was a mishmash between theatrical pizzazz and classic southern heart. Yes, it’s built on a foundation of fantastical fairy tales, but, as Edward puts it, in Alabama, “we got stories under every leaf and every stone.” Set design by Alex Porter does an exceptional job of portraying that unique aesthetic; composed primarily of a large, wooden structure serving as a backdrop, along with a handful of other small set pieces, it was both extravagant and rustic. Lighting design by Lana Riggins, which provides a subtle but artful underscoring for the show’s most emotional and exciting moments, was also a highlight. The pit orchestra was positioned just upstage of the show’s action, where their performance could be emphasized. The six-piece orchestra, led by pianist and music director Michael Tan, sounded stunningly full as they tackled Andrew Lippa’s cinematic, Americana-inspired score. Emily Mudd shined as Edward’s kind-hearted, mild-mannered wife Sandra, and her beautiful soprano voice was showcased in “I Don’t Need a Roof.” Michael Nugent gave an emotional performance as Will; his duet with Montes, “The River Between Us,” in which the pair sang about their seemingly irreconcilable differences, was especially stirring. Also noteworthy: Nick Rose as the polite, soft-spoken, and agoraphobic giant Karl; Richard Greenslit as Amos Callaway, a showy ringmaster with an extraordinary secret; Emily Alvarado as the Witch, whose incredible range was displayed well in her show-stopping solo “I Know What You Want;” and, of course, the wonderfully charming Samuel Greenslit as young Will. Overall, Silhouette Stage’s “Big Fish” was a show just as fun and fanciful as it was emotive and full of heart. A tale about the power of storytelling, the bond between father and son, and the idea that mystery and wonder can be found in even the most unexpected places, it certainly brought tears to the eyes of more than a few audience members—myself included. 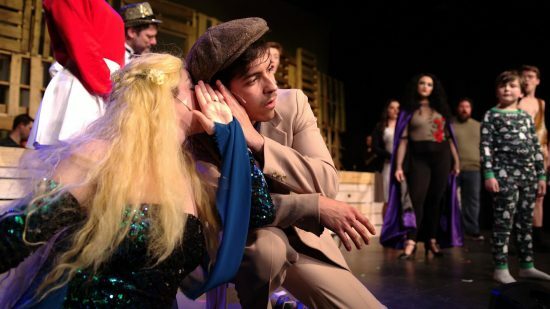 If you get the chance, come out to see “Big Fish” at Silhouette for a rustically charming and genuinely meaningful experience not often found in musical theatre. “Big Fish” at Silhouette Stages plays through May 27th, Fridays and Saturdays at 8 pm and Sundays at 3 pm, at Slayton House, 10400 Cross Fox Lane, Columbia, MD, 21044. For tickets and information, click here.